The 1964 European Cup Final was a football match played at the Praterstadion in Vienna on 27 May 1964 to determine the winner of the 1963–64 European Cup. It was contested by Italian side Internazionale and five-time European Cup winners Real Madrid. 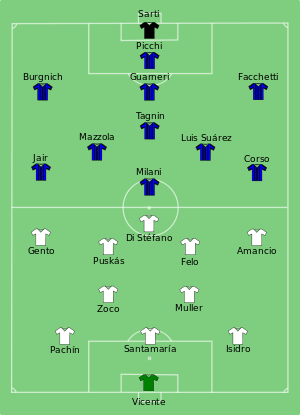 Inter won the match 3–1, with goals from Sandro Mazzola (2) and Aurelio Milani giving them their first European Cup title; Felo scored Real Madrid's only goal of the game. ^ a b "UEFA Champions League – Statistics Handbook 2012/13" (PDF). UEFA.com. Union of European Football Associations. p. 130. Retrieved 22 September 2013. This page was last edited on 30 January 2019, at 06:05 (UTC).